Think it’s impossible to pair wine with all of those turkey day flavors? Believe it or not, it actually is quite possible. Pairing wine with all of the variety can be tricky but there are certain wines that pair well with all of your wonderful, traditional turkey holiday dishes. After all, the Thanksgiving table is filled with a variety of foods, differing in flavor and texture. All of your family’s favorite dishes are delicious and deserve some fabulous wine alongside. These wine picks will be sure to enhance your traditional Thanksgiving meal this holiday season. Thanksgiving is all about being thankful for what we have in our lives. Why not celebrate what we are thankful for with bubbles! Sip in class with Bollinger Brut Special Cuvee or for a little less money, try the Charles Lafitte Brut Prestige, excellent bubbles from France that won’t break the bank. 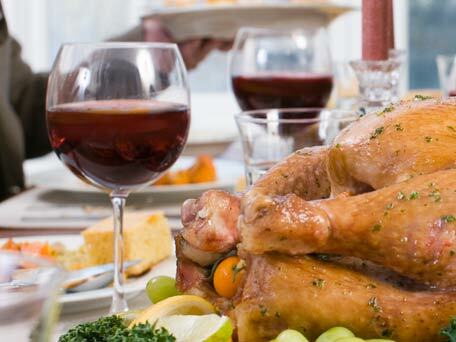 Riesling and Beaujolais wines are classic matches to pair with traditional Thanksgiving dishes. Not only is Riesling a good match for the flavors of turkey day dishes because of the acidity, most Riesling wines are low in alcohol, making it a smart wine to drink if you tend to eat your Thanksgiving meal earlier in the day. After all, you want to stay awake for your turkey sandwich at the end of the day while you watch football! Try the 2011 Chateau Ste. Michelle Eroica Riesling from the Columbia Valley in Washington state or the 2011 Clean Slate Riesling from the Mosel region in Germany. Beaujolais wine, which is a light red wine from France, has nice fruit structure and good acidity, making it a classic red wine match for your holiday meal. Try the 2010 Duboeuf Moulin-a-Vent Domaine des Rosiers or the 2010 Duboeuf Fleurie Domaine des Quatre Vents. Both are classic Beaujolais wines, crushed red berries, excellent acidity and have a great finish. If you want to stay with the red, white and blue this Thanksgiving, Zinfandel is the way to go. There are two styles of Zinfandel and you could go either way for your turkey dinner. Choose either a jammy and luscious Zinfandel or a spicy and structured one depending on your taste. If you prefer a jammy and luscious Zinfandel try the 2009 Murphy-Goode Liars Dice Zinfandel. If your palate leads you towards the earthy, spicy and structured Zinfandels, try the 2008 Sebastiani Dry Creek Valley Zinfandel. We recommend two other fabulous wines to try if you want to keep it “All American”. The 2011 Angeline Reserve Pinot Noir ; it’s smooth and supple with ripe flavors of cranberry and dried red cherries with a light finish and the 2010 Montinore Pinot Gris from Oregon, which has wonderful stone fruit aromas and a hint of minerality. It is nicely balanced, fruity, smooth and has excellent acidity. If you want a delicious, classic wine with your Thanksgiving dinner to celebrate in class and style, go with white and red Burgundy. Both will pair beautifully with the variety of dishes on your table. Keep it classy and stylish with the 2010 Joseph Drouhin Clos des Mouches Premier Cru Blanc white burgundy. It’s fruity, smooth with rich texture and structure. For a red Burgundy, try the 2009 Joseph Drouhin Gevrey-Chambertin. It’s smooth, supple and is a beautiful bouquet of aromatic floral notes and red fruits. For more turkey day wine suggestions, check out our Thanksgiving Wine Guide for ideas. Do you have a favorite match? Share with us!